Decorating with mason jars (vintage or new) is easy, budget-friendly, and can add the perfect touch of farmhouse style to your decor. 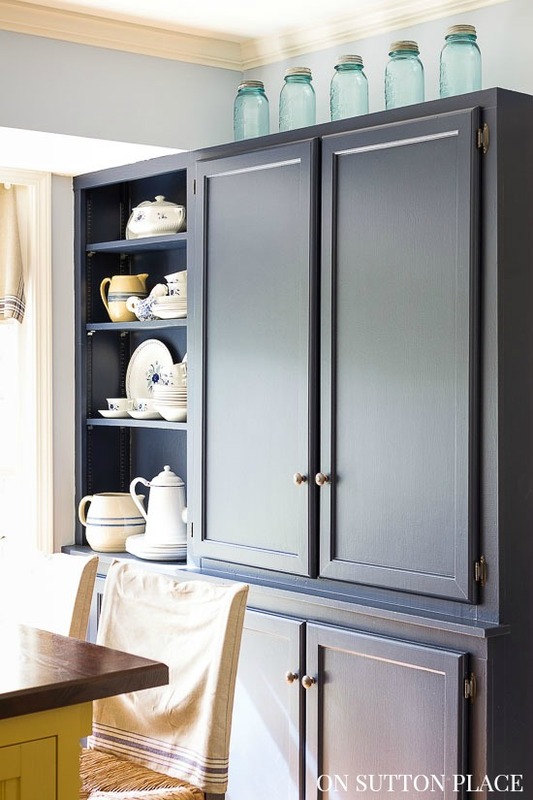 I remember the first time I saw vintage blue mason jars lined up on a shelf in someone’s kitchen. It was in a magazine, but I don’t remember which one. From that moment on, I was smitten. I hopped on eBay and found a “lot” of jars for hardly any money. In fact I think the shipping was more than the cost of the jars. There were 9 or 10 jars in the box…all wrapped up in newspaper. As I unwrapped each one, it was just like Christmas. I have used them in my decor since the day they arrived on my door step. I’ve added a few more along the way, but that original group of jars is still the heart of my collection. The small space above the blue cabinets in my kitchen is the perfect spot for a row of mason jars. It’s not very high so most things don’t fit. 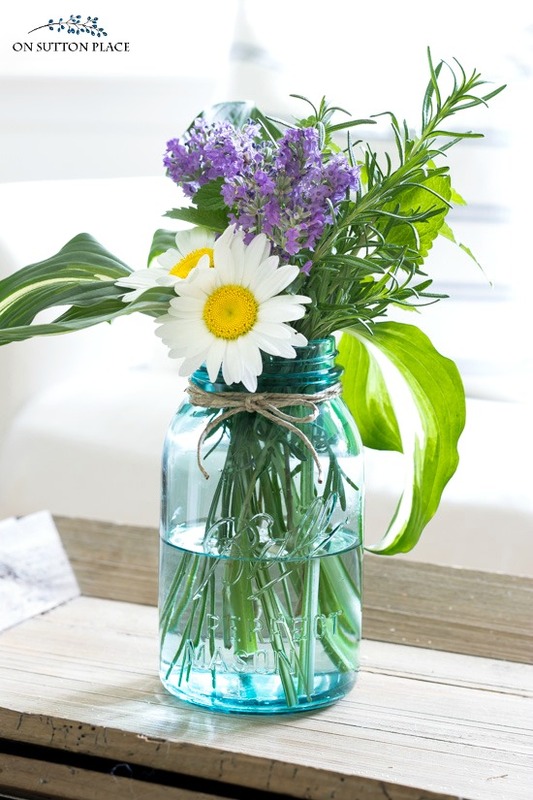 If you have a small space that needs a little charm, mason jars are the budget-friendly answer. 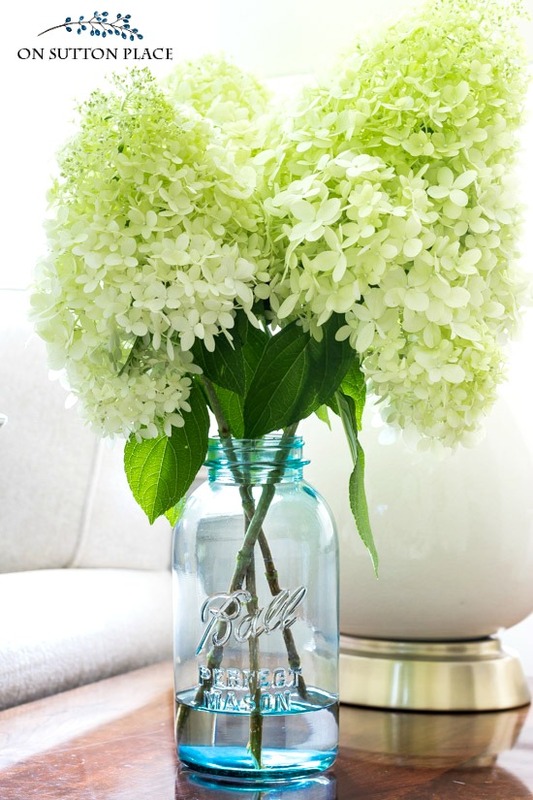 Of course, in my opinion, mason jars make the perfect vase. Anything looks better in a mason jar! I use them for flowers, greenery and herbs, all through the year. Mason jars can double as storage and decor. They can be used to store just about anything! 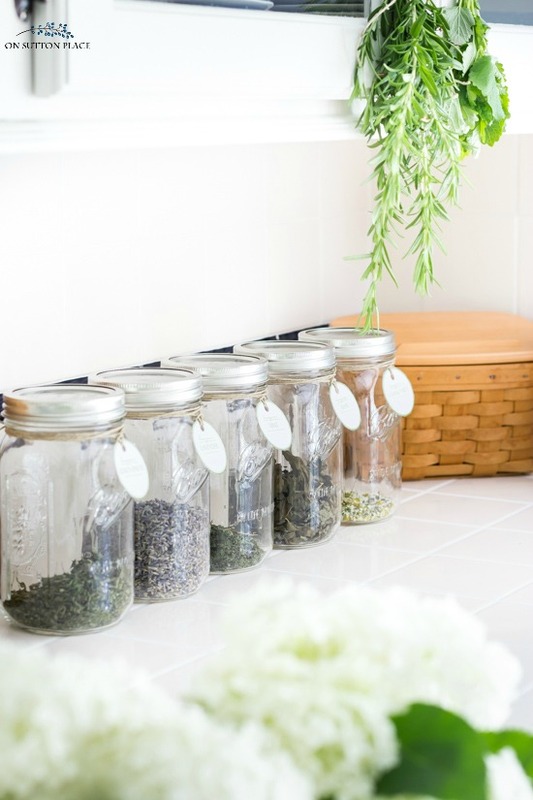 One of my favorite ways to store dried herbs is in mason jars…and I love the way they look on my kitchen counter. baking soda, baking powder, salt, etc. Even though this post is about decorating with mason jars, I want to show you a few other ways you can use them. 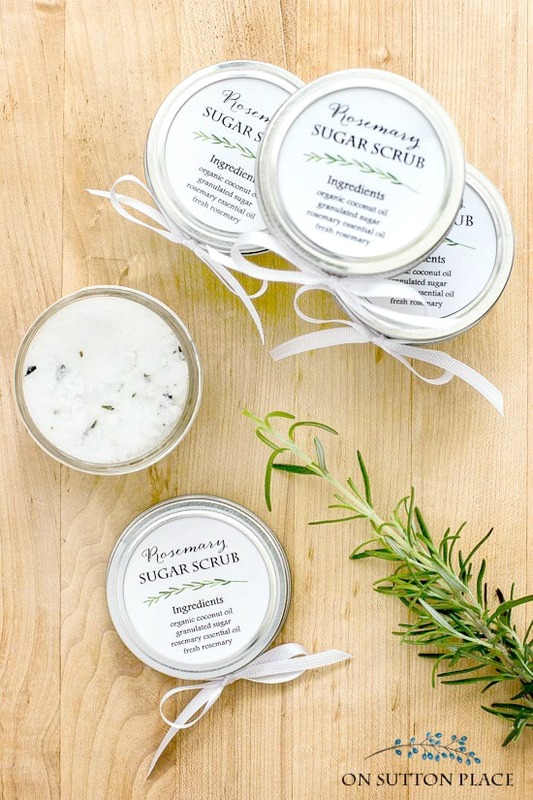 They are a very pretty packaging idea for homemade sugar scrubs. 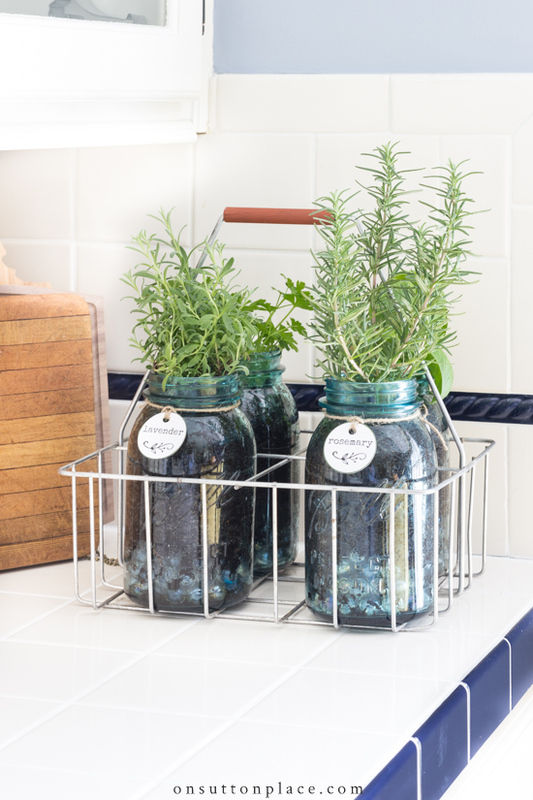 Mason jars can also be used to grow an indoor kitchen herb garden. It’s possible to drill a hole in glass, but to provide drainage, using some smooth stones will do the trick. My whole philosophy when it comes to decorating a home is that it should be filled with things you love. Who cares what is trending or popular? If you don’t completely adore it, it doesn’t belong in your home. I like to mix styles and really don’t care if they clash a little. I mix my vintage/farmhouse accessories with my traditional furniture. It may not work for everyone, but it works for me. That is the whole idea of making a house…a home. There are a variety of watercolor printables featuring mason jars available in the Members Only Library. If aren’t an OSP email subscriber, and would like to take a look at the library, just click the image below. Like you, I love mixing my traditional style with my love of simple country pleasures, vintage and antiques. And, like you, I vividly remember my excitement when a friend returned from W Virginia with a bevy of antique blue Ball jars for me. I keep my beauties atop the laundry room cupboards and recently they set the theme of tiny boy’s baby shower holding candies and flowers…baby’s breath of course! Never thought to grow herbs in them. Thanks, your inspiration is always a high point in my day. Hi Ann, I am a subscriber but I don’t comment that often on your site. I just wanted to let you know that your blog is a welcome source of sunshine and beauty in my life. My mom passed about 5 years ago. We used to do a lot of the kinds of things you do on your blog. So…your site is a great comfort to me. I have been so sad that I stopped beautifying but I was able to live vicariously through your projects. I bet you wonder if your efforts make a difference sometimes…and the answer is a resounding YES. Thanks again for all that you do. Thank you so much Nina for taking the time to write…I appreciate your words of encouragement. I do wonder sometimes but you all are so kind and generous with your comments. I know I am very lucky in that regard. I love the look of mason jars, especially the blue ones. Your home always looks so cozy and inviting. Just a lovely, lovely space. I love the way you use the mason jars. Beautiful!!! I love old and traditional together too. Hi Ann! That’s why I like your blog. You mix styles and decorate with what you love and don’t apologize for it. And you don’t follow what everyone else does making a cookie cutter style, you do your own thing, and I love it! I like several styles too and somehow it all works, lol! The mason jars look so pretty on top of your cabinets.Love using them for just about anything.They add a bit of charm and nostalgia to your home. I love Mason jars! A few were dug up when we built our house. That’s when I fell in love, over 25 years ago! I use them like you do, and they look especially good with flowers. They are a treasure! ,I have been collecting jars since I was 15 when my great grandmother died. I use them, all sizes, shapes, and brands for many things. I love seeing the new ways to use them. I have too many just to use them for beans and rice. Your house is so pretty. Oh your collection must be amazing Judy…thank you so much for stopping by! Loved seeing all your Mason Jars in various locations and uses in your Home. I use them too, but my reason for collecting has a different focus. My maiden name was MASON. 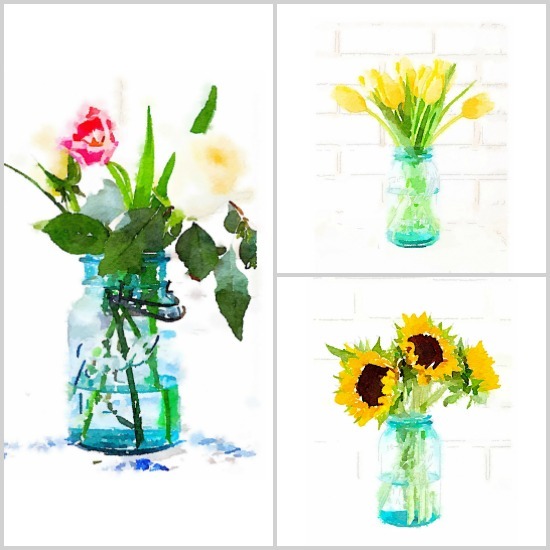 I had to smile when I saw your yellow flowers in the blue mason jars….I have that very combo in my entry today…the mason jar was my grandmother’s and it brings a smile to my face when I remember being a little girl and eating green beans that she had canned in the jar! I was convinced that the beans would be blue when she opened the jar! Always disappointed in the color but never in the taste! Ann, love your decorating philosophy, the jars and you! Your mason jars look so pretty each way you’re using them, Ann! They make such great containers for all sorts of fun things. Love all of your ideas! I love the way you used the mason jars. I have some clear ones. I’ll have to go on ebay to see if there are any blue ones at a reasonable price. I use blue “anything” in my house. You have again taken a simple thing and turned it into a decorative touch. I have to ask where you purchased your sweet little “cream color” table in the living room, as well as the 3-tiered container in your entrance. You continue to be an inspiration with your decor and recipes. I look forward to your post. Hi Carole! The little table in the living room came from my husband’s family. I painted it with chalk paint. It was in very bad shape and now I just love it. The 3 tiered stand was offered a few years ago by Decor Steals…fairly soon after they opened the website. If I ever see another one I will try to post on my blog. Thanks for visiting! Love, love, love mason jars. I have a ton of clear and a few blue. Thanks for the tips on their usage. As always I love everything you do., Ann. Thanks so much for adding me to G+ and hello to a fellow Ohio blogger! Love your site, Ann! Loved your post! I completely agree with your decorating philosophy about using and displaying the things you love. There are so many things I love that I have to rotate my collections in and out to give them all a chance! I don’t know what I enjoy more: the treasure hunt or decorating with them. I like to mix old and new too. Really enjoy your blog it is very inspiring. I too fell in love with Mason jars many years ago and I have quite a stash. I use the very large jars for storage of my various flours (wheat, all purpose and self rising) pastas, and the small jars for my dried herbs from the garden. I store the jars on the open shelves of my kitchen and this has become the decor in my cottage. Every room you enter in my little cottage has at least one blue Mason jar. Perhaps I should name my home The Blue Mason Jar Cottage. I love your home and appreciate all the projects that you share with all your followers. LOVE your collection of mason jars Ann. You have them all displayed and filled so pretty per season! They look gorgeous in your home. My house is full of Mason Jars. We had a “Mason Jar” theme for my daughter’s Bridal shower. Jars of flowers on all tables as centerpieces. Guests were given them as prizes. I have collected them at flea markets and antique shops. Always excited to find ones with the Zinc lids attached. Just love looking at them in the sunshine. Your photos and ideas have given me some inspiration for this spring and summer. Thanks! Two questions… Ok how did you get your mason jar to look like that? I want to do that to some of my silver lids. Also love the blueberry basket too, it looks porcelain. Did you do something to it? Oops, I didn’t really ask the right question. I was trying to say, how did you get your lids to turn out with that white washed look? I love your mason jars filled with gorgeous yellow roses! I usually combine Queen Ann’s Lace, sunflowers & small flags in Ball jars during summer, but as soon as my yellow roses bloom, they’re going in jars, too. I treasure each one I have. Your jar displays are great! I have all my staples stored in antique jars as well as many of my sewing notions in my sewing room. Your blog is my favorite….such wonderful simple ideas and fantastic recipes that are easy and use items I have on hand. Keep up the good work. Oh yes and your photography is beautiful! Yes, I love mason jars! Unfortunately, the blue ones, which I love most of all, don’t work in my house. I’ve got a couple of jars in my kitchen, but you’ve inspired me to add more of them to my traditional decor! Love your photos & ideas – love,love,love those mason jars!! I love your ideas…especially for the Q Tips and in the tiered stand (I’ve been wanting one of those but was never sure what yo put in it…your post did double duty!!). I have been incredibly lucky to find them in the country near our lakehouse for a dime a dozen (and with the original zinc lids!). I keep all of them grouped on my buffet in the kitchen and occasionally use them as vases. I can never think of anything else!! I think I may try a beach themed one like yours! Thanks, Ann! I saw some of these jars in store this week (Hobby Lobby?) and thought, they sure are pretty but what would I ever use them for? Well, now I know! Thanks for all the ideas, and I really love those yellow roses in them!! LOVE mason jars. I have some ‘antique’ ones and the commemorative blue ones. I even have one of the larger ones converted into a lamp in my kitchen (screw on top with electric cord attached)with a white lampshade on it. I like your style and have been enjoying your blog for a few months now. Thank you for sharing with us. 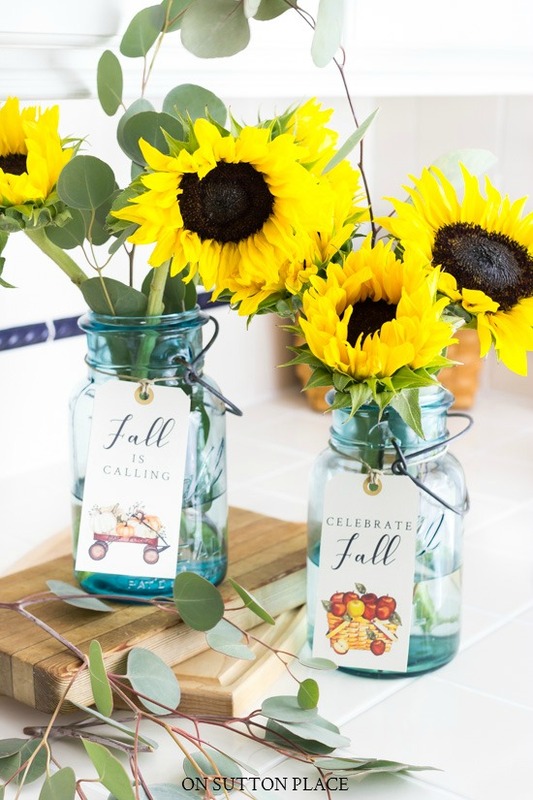 Love the blue mason jars…..I have several…..I need to find them and start using them again.The yellow flowers look so pretty in the jars. Yes I saw those green jars and bought them for my daughter! My Granny left some of these in her house; I also have several of Mother’s. Granny used to make a hole in the lid and feed her knitting and crochet thread through it. It kept the puppy out of the thread! I bought my first blue mason jar about 5 years ago at the farmer’s market. There is the sweetest lady who sells fresh cut flowers in recycled containers. I was lucky to get the jar and today it is sitting on the kitchen table with roses in it. I love your decorating style, Ann. Everything is beautiful and welcoming. I like to think I loved mason jars before they were trendy. I certainly remember the first one I bought, and would you believe it was an old blue one with a zinc lid, and I got it for a song at a yard sale. Now, I find they’re much pricier, but I still hunt for my bargains. I so agree with you, Ann, about surrounding yourself with the things you love whether they’re in style or trendy or whether they “go together,” as it were. That’s how you create a unique style and home that you love. I love all your mason jars, and your photography is stunning, as always. Oh my gosh Amy what a lovely comment…thank you! I have had my mason jars for several years…even before I started my blog. I agree, it’s hard to find a bargain now but if you look they are out there! Ann, your beautiful photos brightened my day. I have six jars I purchased at Target last year hoping to use them as drinking glasses for picnics out on the deck. Never unpacked. But I did purchase one jar at a thrift shop and a large blue glass jar on sale at PB and used them as vases last summer. I really like your tiered stand. I love these ideas for decorating with mason jars, and your photos are so pretty. Those yellow roses with the ball jars are so pretty…I also have a lot of them and I think they go with any style of decorating. I pinned a few of them! 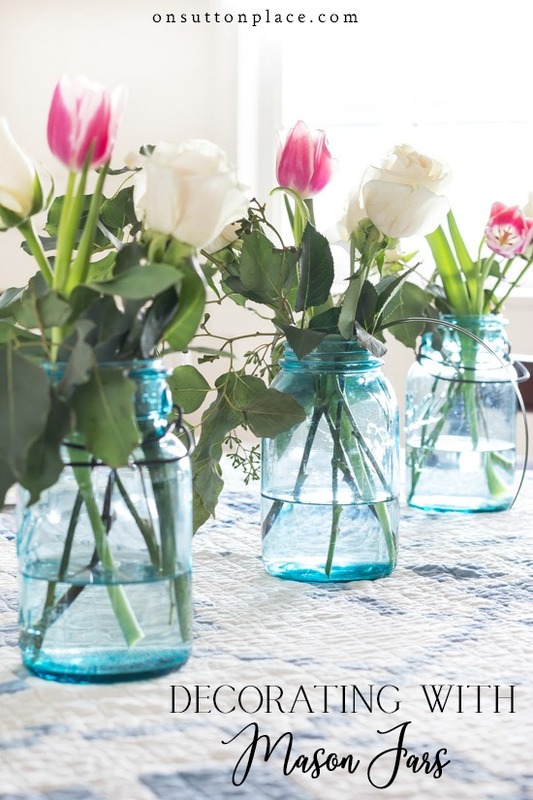 Thank you so much for showing us simple ways to decorate with mason jars. I have a case of blue ones and will be incorporating some of your ideas. Your photos are beautiful and yes I love my mason jars. I use them for everything. They fit in so well with all of my decor throughout the entire year. I do love Mason Jars. They look lovely the way you are displaying and using them Ann.